← Passages From the Bible that Scare the “H-E-Double Hockey Sticks” Out of You. Venus and Spica continue their weeks-long conjunction in the eastern predawn sky. Conjunction of Venus and the star Spica in the predawn sky, Nov. 20, 2018. Credit: Stellarium / Bob Trembley. Saturn becomes the "evening star" in the southwestern sky at dusk; if you're lucky, and have a clear horizon, you might catch a glimpse of Mercury very low in the sky around 5:30 PM ET on Nov. 20th. Saturn is now the "evening star" in the southwest, and Mercury is low near the horizon at dusk on Nov. 20, 2018. Credit: Stellarium / Bob Trembley. Mars and Neptune will be high in southern sky after sunset all week. Mars and Neptune are high in the southern sky after sunset on Nov. 20, 2018. Credit: Stellarium / Bob Trembley. Close-up of the location of Neptune and Mars on Nov. 20, 2018. Credit: Stellarium / Bob Trembley. Uranus is above the Moon! Yea, I said it! Actually, when generating images for this post, this image made me laugh pretty hard... Uranus will appear above the waxing gibbous Moon in the eastern sky after sunset on Nov. 20th. Uranus is above the Moon in the eastern sky after sunset on Nov. 20, 2018. Credit: Stellarium / Bob Trembley. The full Moon appears very near the star Aldebaran after sunset on Nov. 23rd. Conjunction of the Moon and Aldebaran after sunset, Nov. 23, 2018. Credit: Stellarium / Bob Trembley. Artist concept of InSight landing on Mars. Credit: NASA/JPL-Caltech. Mars InSight is the first robotic mission to study the "inner space" of Mars: its crust, mantle, and core. 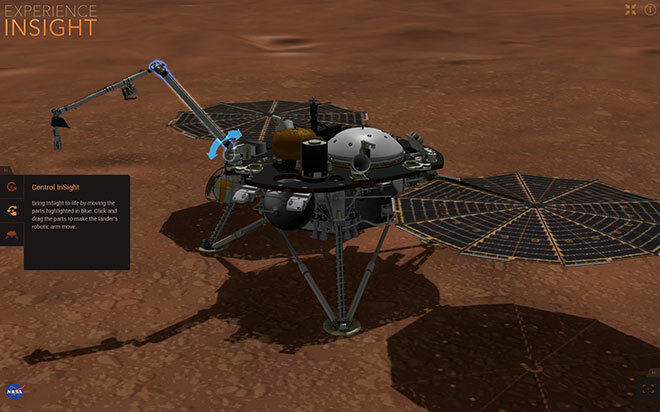 InSight will land on Mars on Monday Nov. 26th at 2:55 PM ET; NASA is using the media to highlight the event, with a press kit, landing events, and live broadcasts on NASA TV and YouTube. The Moon is a waxing gibbous, heading towards full on the 23rd, where it will be visible all night long. After the 23rd, the Moon will be a waning gibbous. The Moon from Nov. 20-26, 2018. Visualizations by Ernie Wright. Decaying Sunspot AR2727 Nov. 20, 2018- left: SDO/HMI Quick-Look Continuum, right: SDO/AIA 211, 193, 171 angstroms. Images courtesy of NASA/SDO and the AIA, EVE, and HMI science teams. Coronal holes remains open at both poles; coronal activity associated with AR2727 can be seen on the right of the animation below. Some coronal loop activity can be seen rotating into view on the left of the animation below. SpaceWeather.com says "Today, a minor stream of solar wind is brushing against Earth's magnetic field, causing geomagnetic unrest and intermittent auroras around the Arctic Circle. The action of this solar wind stream should continue for another ~24 hours." Prominences appear to be short-lived for the last couple days... not that I've been able to see any - living here in Mordor Michigan, the clouds have broken only for a few moments in the last several days. Update: Early this morning, I brushed snow off the car before my wife left for school; as I was pouring the last cup of coffee from the pot, I noticed the sky to the east is a brilliant blue! NO CLOUDS! I rushed to the south window and looked out... mmrph... clouds... But, hey - first blue I can remember in days! The solar wind speed is 415.2 km/sec, with a density of 9.0 protons/cm3. Woo-HA! Look at 2018 WG, passing within 0.1 Lunar Diameters on Nov. 16th! Near-Earth objects (NEOs) discovered this month: 171, this year: 1793, all time: 19191. On Nov. 19, 2018, the NASA All Sky Fireball Network reported 96 fireballs - WOW! This is the position of the planets and a couple spacecraft in the solar system; The Parker Solar Probe has almost recrossed the orbit of Mercury after perihelion 1, and Mars InSight will land on Mars on Monday Nov. 26th, at 2:55 PM ET. Position of the planets in the inner solar system, Nov. 20, 2018. Credit: NASA Eyes on the Solar System / Bob Trembley. OSIRIS-REx - 75 miles from asteroid Bennu! Mars InSight - Lands Monday Nov. 26th! Voyager 2 - Almost at the edge of the Sun's Magnetic Influence!